What Does a Wreath of Flowers Have to do with Your Business? 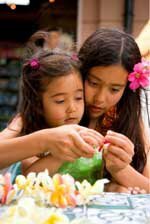 The first of May is May Day, which is Lei Day in Hawai’i. While it’s never been made an official state holiday, Lei Day has been commemorated in Hawai’i every May 1st since 1928. It includes the tradition of wearing a Hawaiian lei (a wreath worn around your neck or on your head made of fresh flowers or ferns) and celebrations throughout the islands. As a little tomboy growing up in Hawai’i, I woke up dreading Lei Day because our school required the girls to wear flowery printed dresses (mu’u mu’us) on that day. Thankfully, I was able to ignore the dress when I focused on the fact that it was one of those school days where we celebrated with hula, singing, and a very special school lunch: a Hawaiian plate with kalua pork (a whole pig roasted in a “imu” or pit, then shredded) and cabbage, rice or poi (boiled taro root pounded into a paste), chicken long rice (chicken with glass rice noodles), lomi lomi salmon (a fresh tomato based salad with salted salmon, minced green onions served ice cold) and haupia (the Hawaiian version of coconut jello). Simply ono (Hawaiian word for delicious)! Throughout the year Hawaiian foods, beaches, volcanos, sun, and culture (including the leis) are all things that bring people to the islands. They’re partners in the tourism business that makes up so much of Hawaii’s economy. Luckily, these partners aren’t people so they’ve never had to formalize their legal partnerships. But unless your business partners are inanimate objects, you probably want to make sure your partnership is legally sound. One Hawaiian food business grew from four friends in a part-time labor of love to $10.3 million business in 15 years. When they first started off, they acted as partners with equal interests in the business, sharing in the management and operations. As time progressed, they formed corporations and a limited liability company. Some of the friends still considered themselves as partnership. As a result, their legal relationships became unclear, calling their liabilities into questions and making the division of the profits problematic. Why did the change create legal issues? Because your responsibilities can differ if you are in a partnership, versus some other type of legal entity like a corporation or LLC. How is a partnership different from a corporation? In contrast, a corporation or a limited liability company is not the same as a partnership. While you and your best friends may agree to conduct business together with equal interests, control, and management of your corporation or LLC, your liability is probably different (depending on your state law). Generally, your liability is limited to the extent of your interests in the business, assuming that you have properly maintained your corporation or LLC. If you don’t properly maintain your company, a court could interpret your business as a partnership (thus increasing your liability). Interested in learning more? Contact Dodge Legal and ask for our Best Practices List to Avoid Piercing the Corporate Veil – (which applies to LLCs too).